The film Unmaking seeks to deconstruct preconceptions about the relationship between body, clothing, production and consumption. Intended as a means of reflection and resistance, the film refers to a post-productivist condition of fashion by exposing the limits of production driven by overproduction within the increasingly global market of the 21st century. This film is a part of larger theoretical research entitled Towards a practice of unmaking: a strategy for critical fashion practices, which Portuguese designer Lara Torres is currently carrying on within University of the Arts in London. Her practice-based research debates the role of the fashion designer and questions fashion’s critical agency. Lara Torres emerged as highly experimental fashion designer, who not only created collections conceptualizing processes of fashion making, but she also opened discussion about fashion industry’s ceaseless overproduction/overconsumption chain which is becoming truly Pantagruelian. Her reflective and radically critical stand brought her to decision to orient her practice in a more activist and artistic direction, producing mostly videos, films and texts which pled for a change of ways in which fashion system operates today. In 2011 she realised set of short films entitled “An Impossible Wardrobe for the Invisible” which presented six different cases of “creation through destruction”. In each of six films male and female models would wear dresses which dissolve as they get in contact with water. Simultaneously this acts of “disappearance” become moments of creation: what remains as traces of fabric and contours marked by seams and stitches, becomes effectively a new “garment”, unique and unreproducible. Yet, for Lara Torres it’s the symbolic weight of this gesture of erasure that counts the most: it is her appeal for stoping and reflecting about why and how to make fashion for the future. Through on-going project Excuse My Dust Series Christina Dörfler Raab experiments with various unorthodox dyeing techniques which involve corrosive, toxic materials and surface-treatments which allude to process of destruction and decay. 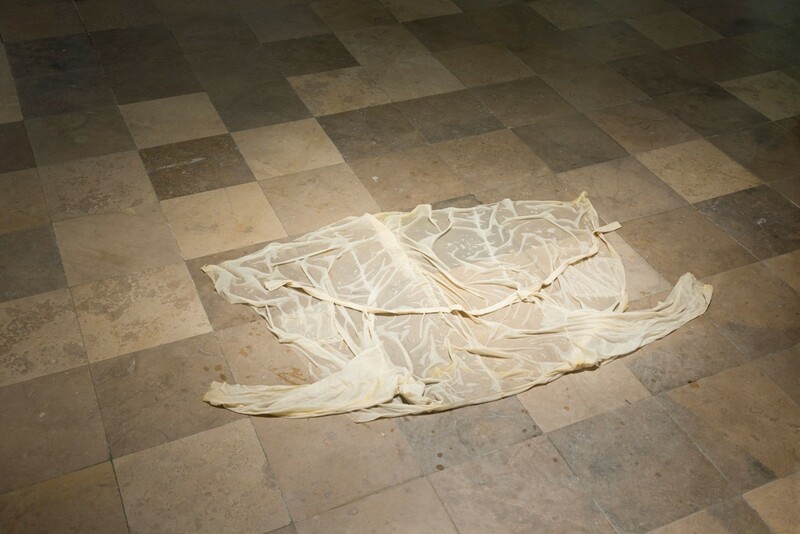 Emphasizing this aspects of fabric-treatment, fashion-designer Christina Dörfler Raab and artist Jasmin Schaitl, aim to raise questions about impact of groundwater pollution by dyeing and bleaching techniques of large textile industries. Yet, patterns created through this procedures strongly echoes sense of ancestral past, connection to the land and it’s natural rhythm of grow and decay. In this sense this work can be seen as a quest for alternative forms of collective gathering, producing, creating and generally living in more sustainable and zero-impact manner. Afra Kirchdorfer approaches the question of the future of clothing by proposing a radical turnover: no more pre-produced garments. Instead, she puts on the disposal of audience sets of modular elements consisting of variety of geometrically cut and shaped pieces of cloth, strings and ribbons of various lengths, as well as numerous “connecting” elements, all accompanied by textual and visual instructions made for inspiring people to make their own cloths. What she creates is modular-clothing-system conceived as both, playful device which anybody can use just for fun, as well as trigger for rethinking entire process of producing, wearing and disposing clothes. Things Will Change is a video-loop created by photographer Lisa Edi and fashion-designer Anna Schwarz, using already existing image-material from Anna Schwarz’s recent Ready-to-Carry collection. This collection consist of garnets whose minimalistic forms and cuts trigger associations on Hellenistic period and it’s statuesque elegance which appears timeless and everlasting. But the title Ready-To-Carry implies another temporal dimension: the one imposed by today’s fashion system, which produces garments ready to be shown on the runway, and than immediately integrated in the super-accelerated consumption machinery. After realizing together look-book of the collection, Lisa and Anna continued their creative dialogue making the video Things Will Change using existing fashion-photographs as a material to be newly re-edited, manipulated and multiplied. Though re-elaboration of images, Lisa Edi and Anna Schwarz question the idea and need for the “New” which is one of main fashion imperatives. 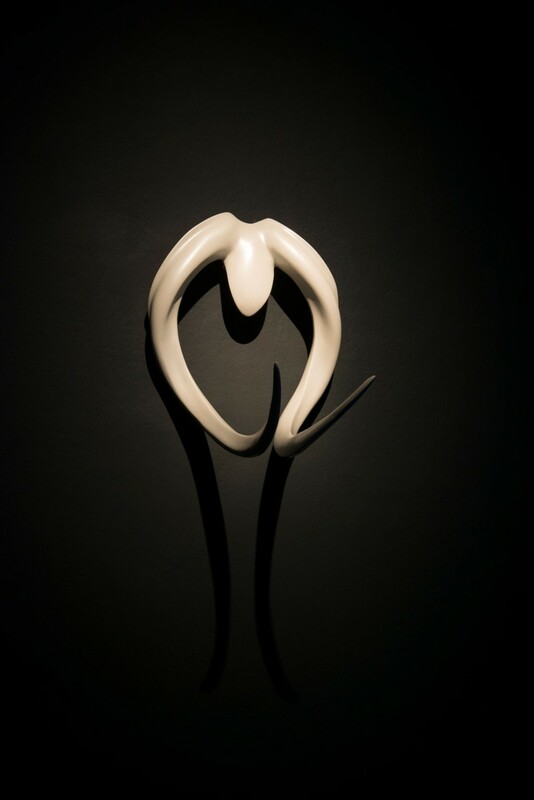 Embody is collection of sculptural pieces that the body can fit into or onto, attempting to negotiate the necessity to wear adornments or appendages. This series of (un)wearable sculptures reflect artist’s fascination by the abstract notion of body-imprint and function. Her practice intends to realize materiality, corporeality and tactility into solid and tangible objects, whilst retaining a synthesized and experiential memory of the performative elements involved in the process of making. Suggesting and illustrating the negative space formed around a human body, the concept of her earlier collection Mode Metonym and it’s spin-off collection Embody, was intended as a response to the ever-shifting boundaries between art and fashion. This area of slippage where, as in this case, the ‘artefact’ becomes ‘wearable art’, and the object becomes a beckoning tactile invitation to touch and feel. Transcription – untitled is process-based work especially conceived and realised for Transfashional which as exhibition-in-progress changes from one presentation to another. Staring point for Manora Auersperg’s work was exhibitive space in London, where was presented the first phase of Transfashional. She created a blueprint of the floor-plan of the building where exhibition took place, aiming to modify this structure adding new layers documenting different spacial structures of subsequent displays of the show. She interprets Transfashional as dynamic relational field where artists/designers are invited to interact. Thus her work comes out from observation and documentation of fulfilled or failed creative interactions between participants. In a performative act the artist relates to exhibition-display of other works inscribing them on the linen by extricating and reinserting threads. Throughout the recursive process of de(con)struction the exhibition´s temporary constellation is transcribed. Maximilian Mauracher works as graphic designer and art-director in the fields of editorial and web design, as well as branding, illustration and photography. But his creative range spans also to collaborative and artistic projects which involve art and fashion, related particularly to interest in our self-perception (or “self-construction”) through digital photography and social media. Furthermore he is developing a kind of “total design” approach, in which fairly everything, from his wardrobe to his Instagram page is subjected to his particular creative imprint characterized by interplay of geometrical structures and oppositions of black and white. Installation Form Follows Flags is part of his ongoing visual research focused on the concept of Form as the very basis of design in general. Simple shapes and abstract black and white patterns of this large scale prints question form and fashion and also pay tribute to Concrete Poetry. Video-collage is composed of photos, movies, samples of textiles, sounds and objects made by designers, students and artists who took part in this seminar which questioned the problem of ‘being active’ and ‘being passive’ as both, creative individual and member of contemporary society. Initial inspiration for this collaborative work was driven from Robert Musil’s novel Die Verwirrungen des Zöglings Törless and Volker Schlöndorff’s movie Der junge Törless. It is conceived as process-based work which changes through different phases of Transfashional project, and will be presented in it’s finalized version in the conclusive exhibition in Vienna in the end of this year. Original soundtrack by Das Rezitativ: Margarita Slepakova (Schola Cantorum Basiliensis) and Clemens Fiechter (Elektornisches Studio Basel). Ana Rajčević is trained in architecture, but she set her practice in the zone of intersection between art and fashion, creating unique wearable objects that merge sculpting techniques and jewelry design, and at the same time, challenge the traditional boundaries of this disciplines. Through her work she explores ways of transforming the human figure creating quite original and inventive pieces of adornment which aim to question conventional notions of beauty and normality. She addresses theme of mutation and evolution, as well as the relationship between rational and instinctive, human and animal. Her collections consist of elegantly shaped prosthetic objects that function as masks or adornments that not only reshape body-features, but question the necessity of redefining the notion of the human. Considering how deep and wide impact advanced technologies have on our bodies and our behavior, seems imperative today to revisit the very notion of being human. Experimentation and research are key words for understanding the work of Linnea Bågander. Another key word is fashion. Even if it is probably not the very first to come in mind when confronted with her videos which show a figure in motion, entangled, enwrapped, cloaked with wide variety of materials which can be soft or hard, shapeless or geometrically structured. But in all this variations body is always central, both visually and conceptually. Because Linnea Bågander’s research is focused on the body, or more precisely, on the space between body and clothes. This space exist as physical, as well as conceptual notion. Exploration of this space means exploration of the notion of wearing, which is fundamental when it comes to fashion. Extending and shrinking this space, outlining it with hard-edged sculptural forms or with soft and transparent fabrics, are all variations of this experimental process which Linnea Bågander carries on with scrupulous meticulosity and lot of curiosity and playfulness. With one central aim: to expand the range of what fashion is or can become. There is something both, scientific and romantic in the fascination with herbariums. On the one hand the urge to collect, classify, archive samples with scientific rigor, on the other, a desire to frieze in time something that is a part of the perpetual cyclic motion of the nature: the life of a plant. Herbariums, especially those from late ninetieth or early twentieth century, are particularly interesting and important for Martin Bergström. That’s where most of his inspiration comes: form a myriad of carefully folded and pressed flowers, enthralling with their allure of fragility, as well as their longevity. Trained as a fashion designer, Martin Bergström is creatively polyhedric and versatile, since he creates garments, but also costumes, textile patterns, wallpapers, interior design objects and projects. For all this different, yet correlated, works there is one common point: pattern. Designing patterns is central to the Martin Bergström’s practice and his hand-painted designs have always same point of departure: plants and flowers selected from his large collection of antique herbariums. Polychromatic palette and virtuously combined and juxtaposed plant-samples create fascinating effect, in which one can recognise a great deal of creative freedom which never flaunts into chaos, though. Like memories, his patterns seems to take shape through layering, sedimenting, merging of images and colours, sounds and scents. More than fashionable garments, his creations are one-of-a-kind paintings rendered in a form that can be also worn. “Never Ending” is part of a larger project entitled “No Body”, through which Minna Palmqvist addresses some of the basic questions of contemporary fashion design. She starts where most of the fashion designers start: from the tailor bust. But in the real sense of the word. She de-constructs and re-constructs that slender and static body-form which has been one of a fashion designer’s most basic tools. It’s idealised proportions and perfect shape influenced fashionable silhouettes for centuries. Moreover, they greatly determined the very notion of our self-image and yearn to conform to fashion’s body-imperatives. For Minna Palmqvist and her homonymous fashion label, the main motto is: female body is not yours to judge! With this bold, provocative, but also highly emancipatory position Minna Palmqvist challenges fashion and its pretensions to con-form us with it’s artificial and capricious ideals of beauty and novelty. No matter how hard one tries, it’s impossible to fit to what is constantly launched and relaunched as a prefect look. To comment upon this, Minna created “Never Ending”: a twelve-piece puzzle made of the parts of both male and female mannequins. All this pieces can be assembled together into various combinations, but they never will get “right”. In humorous and playful way, through this work Minna poses a question if our chase for perfection is useless? At the same time she also raises the question who has the right to define what is a female or a male body. Most of all, who has the right to define what is beautiful body. .